Although the articles talk about why things happen, I thought it would be useful to walk through some common scenarios to see how the date/time may be affected in these different situations. Before we get into that a little about our situation and what we found (forgive the diagram). So in our situation we have an application which publishes an event (item 1 on the diagram) which has an effective date to BizTalk. BizTalk then goes back to the application which published the event and gets some information about the entities associated with the event (item 2 on the diagram). 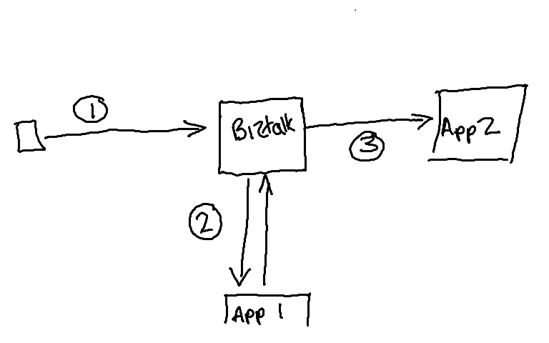 BizTalk then sends this information to application 2 (item 3 on the diagram). In most cases things seemed to work fine, but the enrichment data is date/time specific and we found an example when the events effective date was 26th August 2010 at midnight we were hit by date time issues. The original event which was published send a message to a web service with a date time which was 2010-08-26:00:00:00:000+01:00. In the call back to the application (again via a web service) we flowed the event effective date back to the application but in the process between the two web services the date time has suddenly changed to be 2010-08-25:23:00:00:000. We were able to easily fix this by using the .ToLocaTime() method when constructing the message to send back to the application and because all applications are in the same time zone this fixed this for us. What I did find when troubleshooting this is that there is only certain places where the date is converted so I thought it would be worth talking through some scenarios to elaborate on other articles which explain why this is done. For all tests I would use the below message as the input, and I'im running the tests on a VM where the current date is 28-08-2010 and the time zone is currently British Summer Time (GMT + 1 hour). In troubleshooting our problem I wanted to put together some scenarios so we could be clear on how a DateTime value is affected by the way it is used in different situations and hopefully the following scenarios will be useful to compliment the above articles from a BizTalk perspective. In this scenario I have a receive location which picks up the inbound file. There is a send port subscribing to this inbound port which puts the file back into a different folder. Both ports have pass through pipelines. The below diagram illustrates this scenario. In this scenario I add the message below containing the BST date of midnight on the 28th and it comes out exactly the same and the date is unchanged. A pass through messaging scenario has no effect on the message in terms of the date time. In this scenario I have the same as above in scenario 1 where there are two file based ports. This time the inbound port has an XmlRecieve Pipeline containing the XmlDisassembler. The below diagram illustrates this scenario. The output message contains the date in exactly the same format that it came in, and in the graphic below you can see that the xml disassembler promoted the date time to my property schema and it contains the date exactly as it came in containing the time zone information indicating that I am on BST. This scenario seems to have no effect on the date time. This scenario is an extension to scenario 2 only this time the send port has the XmlTransmit pipeline so contains the XmlAssembler component. The schema has an associated property schema so in this scenario property promotion and demotion will occur. The below diagram illustrates this scenario. In this case the input message results in the message coming out looking like the below. In this case you can see the date time has been converted to the UTC format. In this scenario there is some promotion and demotion of the date happening due to the use of the assembler and disassembler in combination with the property schema. In this scenario you can see that the date/time is changed as it flows through BizTalk. In this scenario I have a receive port with the Xml Receive Pipeline and a send port with a pass through pipeline. I have also got a map on the send port which will convert the input message into the output message. The below diagram illustrates this scenario. In this scenario the below result was produced. As you can see the date/time is still in the BST off set as was in the input file. In this scenario we have exactly the same situation as scenario 4 except that the send port now has the Xml Transmit Pipeline. The schemas both have an element matching to the same context property so the date will be promoted on the way in and demoted on the way out. The following diagram illustrates this scenario. (Update: just noticed the diagram has the wrong send pipeline, it should be XmlTransmit. Ill update this asap). This test produced the below result. As you can see the date is in the UTC format. In this scenario you can see the date/time is affected and really the property demotion happens after the map anyway. In this scenario we will use a pass through receive pipeline and an Xml Transmit pipeline. I will also use a different schema which has no association with context properties so that no promotion and demotion will take place. The following diagram illustrates this scenario. The following message was produced. In this scenario the date/time is unchanged. In this scenario I will accept the input message and then this will be picked up by an orchestration. Within the orchestration I will access the date in various ways and then display the results. The below diagram shows conceptually how this works. The below diagram just illustrates that the orchestration is very simple. It picks up the message then I use an expression shape to access the date. The next picture shows the code within the expression shape. Extracting the date with xpath and creating your own DateTime object will create the DateTime in the localised date format. The below picture shows the message in the orchestrations context properties are shown below. The below picture shows the trace captured with DebugView showing the output from the different things tried in this scenario. Within an orchestration there are a number of scenarios in which the date/time will be changed, but you can also control this through other techniques. This is the scenario you have to be most careful with depending on the approach you take. If you allow BizTalk to assign an xsd element with a date time through property demotion then you can expect the date to be set in the UTC format. If you create a .net DateTime yourself based on extracting the value from a message you will get the DateTime based on the local time in the source application. Going back to the original problem our issue was caused because when we received the event message coming in from the source application we were extracting the effective date from the event message in an orchestration via a distinguished field and the creating our enrichment request message in a .net class which was then sent to the source application. In this process the localised date which came in from the source application had now converted to the UTC format when it was send back to the application which resulted in our enrichment request returning the wrong data for that customers contract. We were able to localise the date again before the enrichment to solve that problem. Excellent article Mike. Very thorough as always. awsome messaging program built to run on PC. bluestackstutorial	you may have through the use of your	WhatsApp on PC nice. good that is declared by Supercell on 3rd January 2016. Clash Royale on PC	Start it, after installing the game and	Clash Royale PC Download nice. good Snapchat is definitely going out a revise today	snapchat download	many of these as Facebook or Range. nice. good over concerning one video gaming streaming TELEVISION	https://imobdrodownload.com	TV streaming application is offered for android mobiles just. best. Great known and With FaceTime popularity, Android	FaceTime for Android	Like Google Hangouts and also Skype, Apple's Facetime Fine. good customers may wonder if they can get FaceTime	facetime for android	is just one of the prominent video calling application nice. good This text is a few software application system known as	Kodi	iphone. Not like android, iOS isn't open supply. It's its directors nice. good an application named as TuTuApp Which is Available	tutuapp apk	Have you ever attempted to download and install best. This application also serves available in Fildo App	Fildo App It may resources see to it that you scan the data. your battery is the problem, then you are truly out of luck	https://jumpstarterguide.com	Even if you're owning around in a new automobile, among these. free entertainment app download for android device cartoon hd apk tv which is safe in use. Some consumers prefer water conditioners that do not use salt. Website	have lots of health benefits that normal H2O simply doesn't. Individuals in today's teen demographic will be going into the	musicallylogin	with applications like Instagram. In the food selection found at the end of the app.